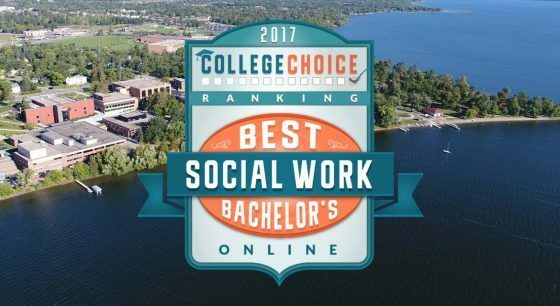 Bemidji State University’s mostly-online bachelor’s degree program in social work has been recognized as one of the nation’s best by the website College Choice. Click here to learn more. Our BSW program equips students with a generalist background in social work while emphasizing an understanding of human interactions in various cultural environments. Students graduate prepared for entry level social work practice as well as for graduate study. Through our blended delivery program (called SWIM – Social Work Integrated Model), students travel to the BSU campus just one Saturday each month for face-to-face dialogue and to learn practice skills. All remaining coursework is completed online. Students develop the knowledge and skills for micro, mezzo and macro practice – working with individuals, groups, families, organizations and communities. A new SWIM cohort begins every two years. New applications to the program will be marked for the 2020 cohort. A program application will be required, and available online in late 2019. The department requires students to have at least an AA degree completed prior to admittance to the program. Additionally, a minimum transfer GPA of 2.25 is required. Program timeline: This is a cohort-based hybrid program taking 6 semesters to complete, and is limited to 20 students in each cohort. The next cohort will begin in August, 2020. A separate application process will be used. Due to limited space in the blended cohort, and if being an on-campus student is a possibility for you, please consider applying to our on-campus Social Work program. 69 credits – view catalog for requirements. The Social Work major is available in the above blended format, and also as a completely on-campus major.